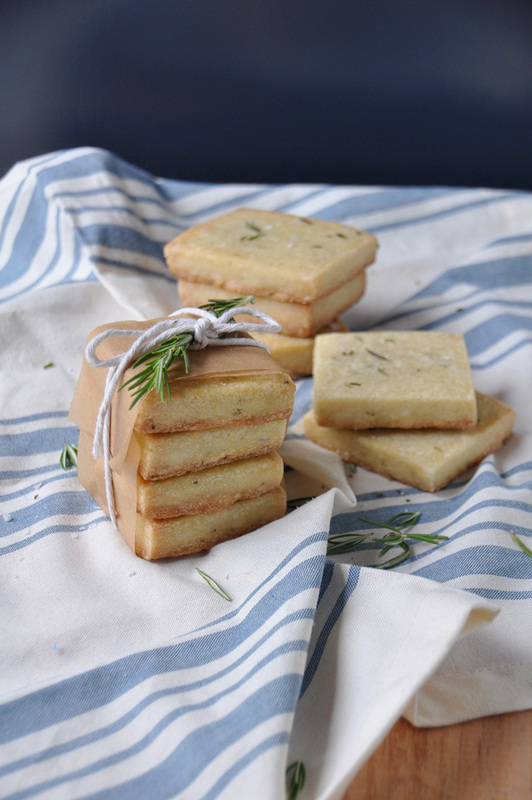 These rosemary olive oil shortbread cookies are one of them. This is a sleeper recipe. You look at it, think it looks good but pass it on for more glamorous cookies like chocolate chip. But don't pass it up, I promise these are amazingly addicting shortbread cookies. The best part is, they are doused in olive oil right out of the oven making these impossibly delicious. Part of my job at Williams-Sonoma is to test recipes that come from chef partners. This rosemary olive oil cookie recipe comes from Chef Ari Rosen from Scopa, one of my favorite restaurants. Scopa is in Healdsburg in the wine country region of Northern California and serves amazing Italian food. I was so excited to test all of his recipes but these cookies, as well as his homemade pasta, were incredible. Actually now that I think about it, everything on the menu that he sent was amazing. But these cookies have stayed with me. Especially as we start to head into the holiday season, these cookies would be great as gifts. Plus with all that olive oil, they will hold for a couple days. Rosemary is strong herb but contrasts really nicely with the butter, sugar and olive oil in these cookies. They are not overly sweet and perfectly crunchy. Also, these would be really easy to make gluten-free, just swap the flour for your favorite GF all purpose mix. So as you are starting to think about holiday gifts or just a fall snack, make sure to give these rosemary olive oil cookies a try. In the bowl of a stand mixer fitted with the flat beater, beat the butter on low speed until smooth, 1 to 2 minutes. Add the sugar, rosemary and salt and mix until well combined, another 1 to 2 minutes. Using a rubber spatula, scrape down the sides of bowl. Increase the speed to medium and continue mixing until the mixture is fluffy and lighter in color, about 5 minutes. Scrape down the sides of the bowl again and add the flour. Mix on low speed just until the dough starts to come together. Scrape down the sides of the bowl again. Reduce the speed to low and mix for 1 minute more. Gather the dough into a ball and place on a large piece of plastic wrap. Cover with a second piece of plastic wrap and, using a rolling pin, roll into a 7-by-10-inch (18-by-25-cm) rectangle about 1/2 inch (12 mm) thick. Wrap tightly in plastic wrap, place on a baking sheet and refrigerate until firm, at least 3 hours and up to 5 days. Using a sharp knife, cut the dough into 1-inch (2.5 cm) squares and arrange on a baking sheet about 1 inch (2.5 cm) apart. Bake until the cookies are golden around the edges, about 15 minutes, rotating the pan midway through the baking time. As soon as the cookies come out of the oven, generously brush the tops and sides of the cookies with the olive oil. Let them cool on the baking sheet for at least 10 minutes, then transfer to a wire rack and let cool completely before serving. Store in an airtight container for up to 7 days. Makes about 45 cookies.